English football crowds outside the Premier League are on course to defy the worst recession in decades and hit a 50-year high, with large credit due to the Championship table-toppers, Newcastle United, and their League One counterparts, Norwich City. According to statistical projections by sportingintelligence, crowds in the Football League – the Championship, League One and League Two combined – remain on course to top 17m people. This will be higher than in any season since 1959-60. The forecasts are based on estimated crowds in the Championship of 10m in 2009-10, crowds of 5m in League One and of 2.1m in League Two. This would represent an increase of 700,000 people in a year in total. In the Premier League, the forecast is a drop of around 500,000 people to 13m paying customers, from 13.5m last season. 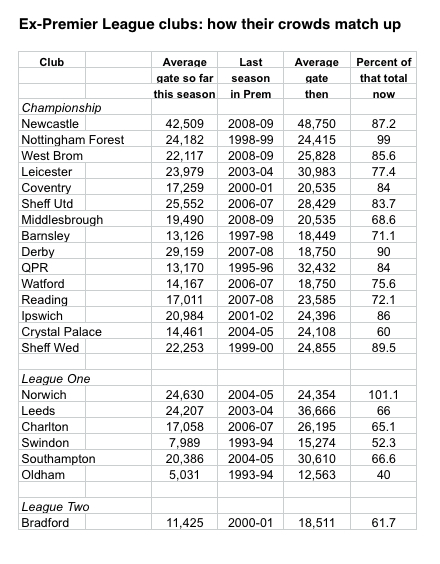 Newcastle United’s gates accounts for a chunk of the rise in the Football League, and for some of that drop in the Premier League. Their gates have help up remarkably well below the elite tier, with an average this season of 42,509, or 87.2 per cent of their levels of the Premier League last season. Norwich, astoundingly, are doing better in crowd terms in the third tier of English football than during their last spell in the Premier League. Their average gates are 24,630 this season, or up 1.1 per cent on 2004-05 levels, when they last played in England’s elite. Norwich’s presence in League One along with other recent former Premier League teams Southampton and Charlton has meant a massive season-on-season leap in average League One gates, up 19.6 per cent from 7,558 fans per game to 9,043 this season so far. Premier League gates are down 3.97 per cent. Championship gates are up marginally, 0.0002 per cent (four people per game) to 17,898. League One gates are down 10.7 per cent. With almost three-quarters of the season gone, a pessimistic “non-adjusted” projection of crowd totals suggests Premier League gates will be 12.94m in total, with gates of 9.8m in the Championship, 4.97m in League One and 2.06m in League Two. Even at these levels, the non-elite crowds will be their highest for 50 years. The sportingintelligence forecasts are slightly higher, taking into account a typical end-of-season “uplift” in attendances. The first table below summarises the surge to a 50-year high in the Football League. To put the growth of the Football League in context: total crowds in those three divisions alone this season will be higher than all four divisions in England combined at the game’s low point in 1985-86, when just 16.49m people came through the turnstiles. The other table below shows the fate in crowd terms of the 22 former Premier League clubs. (Wimbledon are not included because they no longer exist as Wimbledon, but as MK Dons, a different club in a different stadium in a different city). Norwich’s crowds are the most remarkable, at 101.1 per cent their Premier League levels, while Nottingham Forest at are 99 per cent of their last Premier League levels. Derby are at 90 per cent, Sheffield Wednesday are close to that, and Bradford, despite being in the fourth tier, still get five-figure gates at almost 62 per cent their Premier League levels.